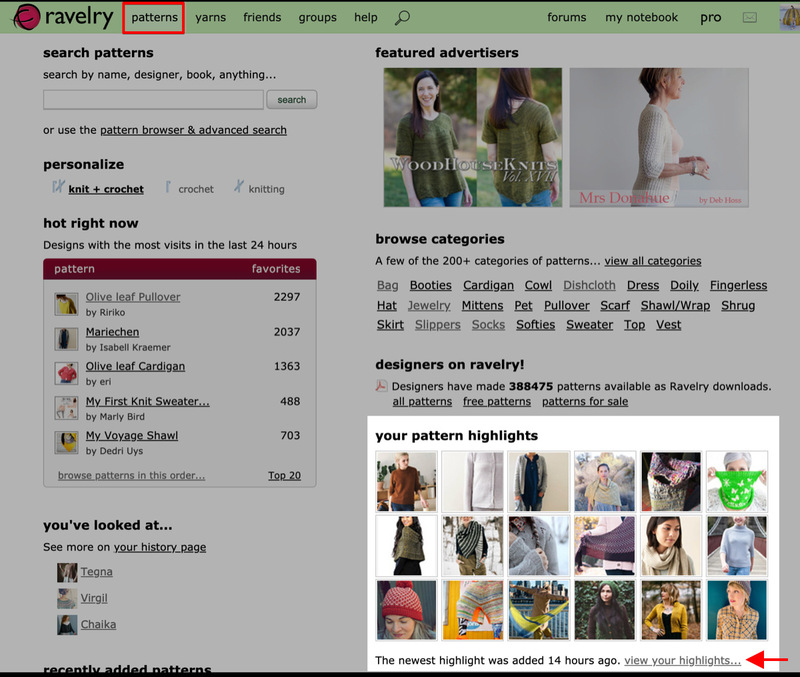 Today we’re going to revisit one of my favorite features on Ravelry: Subscribing to Saved Searches. 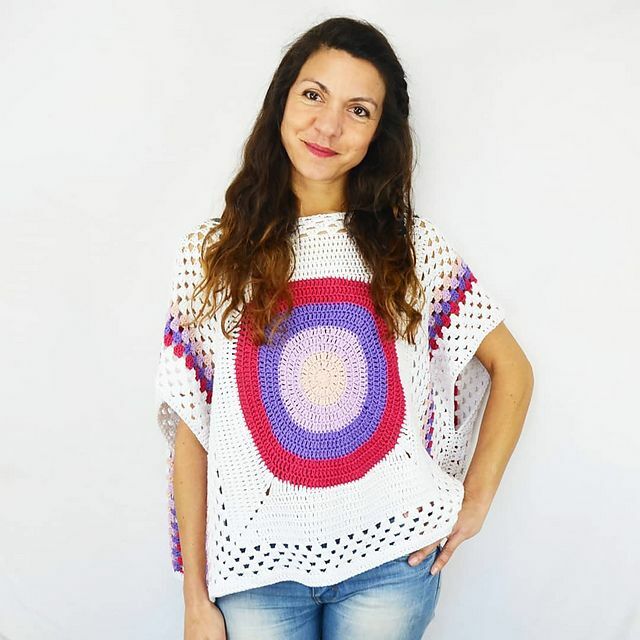 This is a great feature if you like to check the Ravelry database periodically for new patterns that have been uploaded, and fit a set of Advanced Search criteria that you get to decide. Let’s say that I love knitting baby hats to give as gifts whenever I’m invited to a baby shower (I do!). I also like to crank out some hats even if I don’t have a shower coming up, so that I have some backup gifts ready to go (also true). 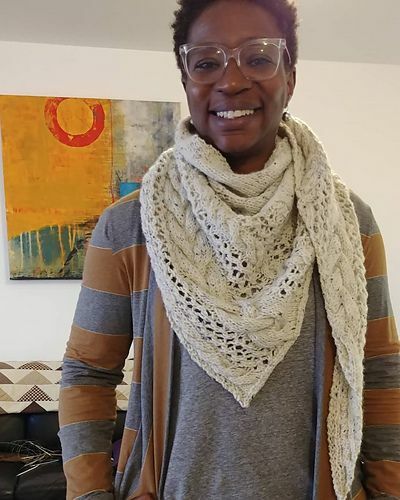 And I’ve knit basically every baby hat pattern there is on Ravelry, so I like to know in real time when a new one is added to the database (this part = definitely not true). 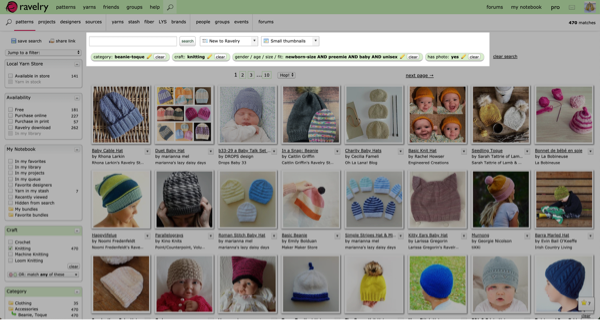 Because I subscribed, a magical thing will now happen: whenever a new baby hat pattern is added to Ravelry that fits my saved search criteria, a little blue dot will appear next to the magnifying glass in the top navigation bar. When I click on that, I’ll see my list of saved searches in the middle. (Your saved searches will always be available here, whether or not there are new patterns. 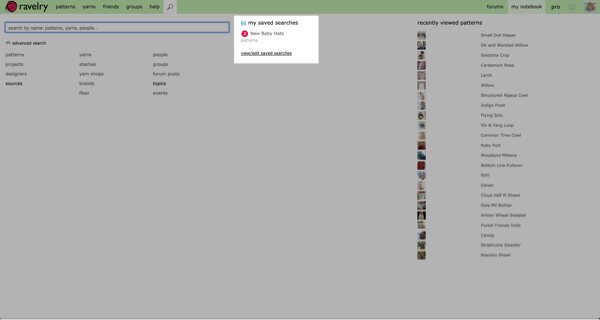 Note that from here I can also click view/edit saved searches to do just that.) Next to my New Baby Hats saved search, I’ll see a big pink dot. The number inside shows how many new patterns there are. 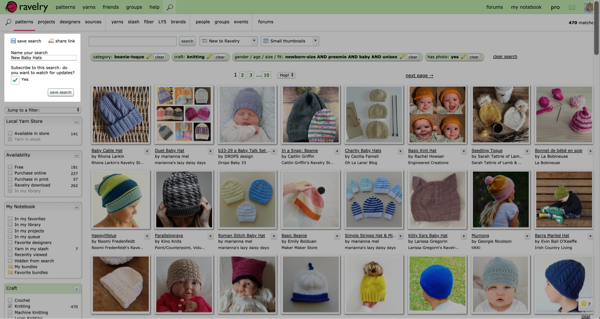 Clicking my New Baby Hats saved search will take me back into Advanced Search, with all of my saved search criteria applied. You’ll also see this notification up at the top, so if you didn’t save your search to sort by newest, you can always do it here. A bazillion other endless possibilities!